NEW YORK, July 14, 2016—The International Center for Transitional Justice has just published a new handbook for non-specialists, journalists and activists, that walks them through the intricacies of “complementarity,” a fundamental principle of the International Criminal Court. It lays out the interconnected relationship between the ICC and national court systems in the global fight against impunity. Complementarity is at the heart of all recent debates about who should investigate and prosecute some of the world’s most egregious crimes — the national authorities or the ICC. The issue has taken center stage in the ICC’s cases against Simone Ggagbo, former First Lady of Cote d’Ivoire, and Saif Al Islam Gaddafi, the son of Col. Muammar Gaddafi, both of whom are wanted by the ICC but have not been turned over to the court. The new 100-page handbook, The Handbook on Complementarity: An Introduction to the Role of National Courts and the ICC in Prosecuting International Crimes, describes the current laws and practices related to complementarity and how they have been applied so far. It is available for free download in English and French. “Complementarity is one of the most important concepts, if not THE most important concept, in the Rome Statute of the ICC,” says Paul Seils, author of the handbook and vice president of ICTJ. Seils, an expert on the subject, worked in the ICC’s Office of the Prosecutor for four years analyzing national proceedings in countries where the ICC was active or could become active. Looking at those limited circumstances and unpacking exactly how the ICC and national governments have interpreted the rules on complementarity in the last 14 years, since the Rome Statute came into force, is the handbook’s main focus. The handbook offers practical lessons from situations in Afghanistan, Colombia, Côte d’Ivoire, the Democratic Republic of the Congo, and Libya, which now are under either investigation or preliminary examination at the ICC. It explains, for example, why the situation in Libya has been exceptional. It was referred to the ICC by the UN Security Council in February 2011, during the Libyan Uprising. Within one week the ICC opened an investigation into alleged crimes. But with the overthrow of Col. Muammar Gaddafi in August, all of the circumstances that has led to the investigation changed virtually overnight. The new government was eager to try senior leaders of the Gaddafi regime domestically, and so challenged the surviving cases at the ICC. 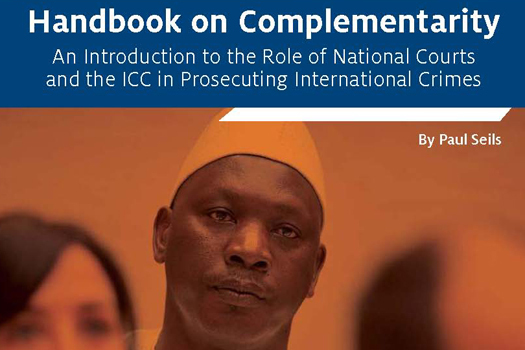 These real-world examples, paired with clearly illustrated graphics, make it easy for readers to understand the ICC, its role, and the particular rules of complementarity. The handbook also includes special sections on what can be done by civil society, national prosecutors, and international donors to support national investigations and prosecutions, recognizing the primary role of national courts in the fight against impunity. For web audiences, ICTJ also created a multimedia project that presents the handbook’s main messages in abridged form and looks at Colombia and Tunisia as case studies. The launch of the handbook is timed to coincide with International Justice Day, celebrated each year on July 17, the day the Rome Statute was signed in 1998. According to the handbook, improving the quality of national prosecutions will be key to winning the global fight against impunity. The writing and publication of the handbook was funded by the European Union.